The Department offers a variety of postdoctoral fellowship and associate positions. Predoctoral and advanced undergraduate appointments are also available as opportunity determines. Fellows and associates can engage in a wide range of experiences that include designing and constructing specialized experimental devices; participating in seminars and symposia; and gathering and analyzing data. These projects are shaped to preserve maximum flexibility and to fit the scientific interests of both Staff Members and fellows. Fellows at DTM are regarded as scientific colleagues, free to chart their individual research agendas. Every fellow has access to the full staff of DTM and the other departments of the Carnegie Institution, as well as to a group of nonresident collaborators and visiting investigators from all parts of the world. Cooperating institutions, universities, government agencies, and private organizations provide further substantial resources for scholarship. There are also joint fellows of DTM and the Geophysical Laboratory in areas of mutual interest. Predoctoral students may be accepted for training in an area of research leading to the preparation of a thesis for an advanced degree at a cooperating university. One or more of the DTM faculty usually serve as thesis advisors. Women and minority candidates encouraged. Carnegie is an equal opportunity/affirmative action institution. For more information about the program please contact Janice Dunlap. On the duPont Telescope at Las Campanas, we have a specialized astrometric camera, designed to measure the positions of stars with great accuracy. 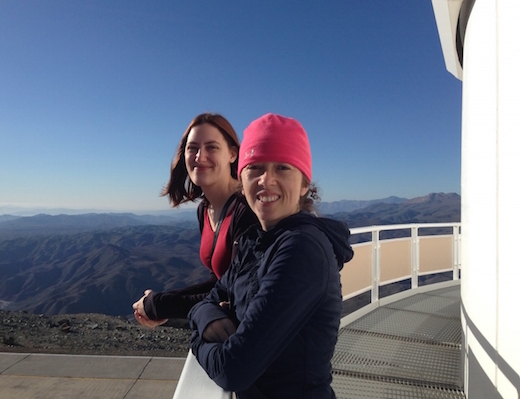 Here is DTM postdoc Jessica Donaldson and former postdoc Jackie Faherty on the catwalk. Photo by Alycia Weinberger, DTM.